The June Singer Clinic for Psychotherapy at The C. G. Jung Center offers affordable, Jungian oriented psychotherapy. This type of psychotherapy not only addresses one’s immediate personal problems, but explores the underlying psychological and spiritual issues which might be contributing to those problems. Dreams and other imaginative approaches might be important in that exploration and often lead to both problem solving and a more conscious sense of the meaning and purpose of one’s life. Reflective of the overall mission of the Center, the clinical services division aspires to assist individuals to strengthen, renew or restore their connection to the deeper Self, and through this process to engage in a journey toward meaning, consciousness and wholeness. The June Singer Clinic services are available by appointment only. Please visit Apply for Services under Clinical Services on the website to complete an application. Once we receive your application, we will contact you to set up an appointment with one of our Intake Coordinators within a week of receiving your application. Please be aware that the June Singer Clinic is not a crisis center. If you need immediate care for crisis related issues, call 911 for assistance. What type of therapeutic issues do you address? *Please note that we are only able to treat clients with drug/alcohol addictions who are also part of an ongoing substance abuse treatment program. In addition, the therapeutic resources and services available at the June Singer Clinic do not allow us to adequately provide services for those with severe mental health issues or for those with issues that require specialized treatment beyond the scope of our mission. We will do our best to find an appropriate referral if we are unable to provide the specific services required. Who should apply for services? Our sliding scale serves both low and high-income clients, so basically anyone can apply. If it becomes apparent through your application or intake appointment that the Center is unable to meet your needs, we will do our best to offer you an appropriate referral. What happens during an intake appointment? When you come in for your intake appointment at the Jung Center, you will meet one-on-one with the Intake Coordinator. You will be asked what you hope to gain from therapy and about your personal history as it relates to your goals for therapy. After the intake session is complete, you will be matched up with a therapist. Where would I see my therapist? 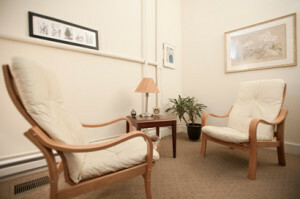 Most therapists see their clients at the Evanston Jung Center. However, we do have therapists who see clients off-site at offices throughout the Chicagoland area as well as the northern, western, and northwestern suburbs. Please express any location preferences at the time of intake and we will do our best to accommodate your needs. What are the fees for therapy at the June Singer Clinic at The C. G. Jung Center? Fees at the Clinic are on a sliding scale determined by the client’s income, number of dependents, and other financial obligations. Your weekly fee will be determined during your intake appointment. The minimum fee is $45/session. Beginning in 2016, The C. G. Jung Center now accepts some BCBS PPO and BCBS Choice plans. If you would like to use your insurance, please complete the BCBS portion on the application.